You'd never know when eating these that they're actually pretty healthy - because they taste sweet, fluffy, rich, and with a subtle spice flavour that pairs with the apple perfectly. But they're made with wholegrain flour, whole chunks of apple, mashed banana instead of egg, and vegetable oil instead of butter - so they're much higher in fibre and lower in saturated fat and calories than most muffins. They also freeze really well, so make a whole tray of these, then pop any you don't eat in a container in the freezer for a rainy day - all you need to do is take one to put straight in the microwave on high for 30 seconds for a warming winter treat to go with your cuppa! Preheat the oven to 200C (400F) and lightly grease a 12-cup muffin tray with vegetable oil. 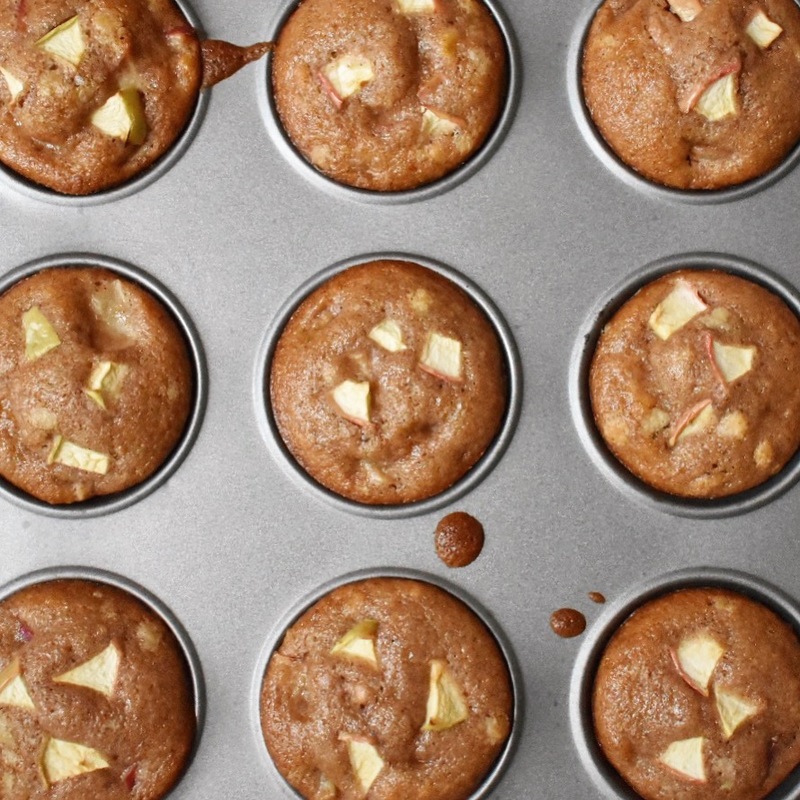 In a bowl, mix the apples with 1 tsp of the cinnamon plus the 2 Tbsp flour (reserve a handful of the chunks to top the muffins to make them look prettier). The flour and cinnamon coating gives the apples extra flavour and prevents them sinking to the bottom during the baking. In a larger mixing bowl, mash the banana using the back of a fork (the banana really needs to be nice and ripe). Add the remaining ingredients and stir to combine, without over mixing. Fold in the apples to the batter at the end. Spoon the mixture into the muffin tray - each cup should be about three quarters full. Top with the reserved apple chunks. Bake in the oven for 15-18 minutes or until a toothpick pushed into the middle of a muffin comes out clean. Allow the muffins to cool for 10 minutes then remove from the tray and allow them to cool further on a wire rack (otherwise they'll go soggy).